St. Charles County, Missouri, puts on several large Christmas light displays, and they include Holiday Night Lights, sleigh rides, and lunch with Santa in Wentzville. Each year, visitors from across the area take in the festive lights and colorful scenes at Rotary Park. The annual Wentzville Holiday Night Lights display at Rotary Park opens on Friday, November 23 for the holiday season. Major attractions include a one-mile light display that features large illuminated scenes and tunnels of colorful twinkling lights. Drive-thru admission costs $8 for vehicles holding up to six passengers; $1 per additional person after the sixth. Holiday Night Lights opens after Thanksgiving and closes in late December. In 2018, the light switch on the display is flipped on November 23. It will be open Thursday through Sunday night through December 9 and starting Dec. 10, it will be open every night until Dec. 30. Holiday Night Lights will be closed on Christmas Day. Holiday Night Lights is a drive-through display with more than a mile of holiday scenes in Rotary Park. If you go on a Saturday night, your kids can visit Santa in the Kolb Building, where there are also trees decorated by a variety of local entities. You can also join Santa for bingo and lunch of pizza, salad, cookies, and punch. You can buy individual seats or get a discount if you reserve a table of 10 for $110. Beginning November 26, you can book a wintertime, tractor-pulled hayride through Rotary Park to tour the Holiday Night Lights. You'll sip hot chocolate, eat warm cookies, and listen to holiday music around a bonfire followed by the sleigh ride (which fits 25 people). Rides are available on Mondays and Wednesdays at 6 p.m., 6:45 p.m., 7:30 p.m., 8:15 p.m. and 9 p.m. Rides are scheduled on a first-come, first-served basis. You can also pay in advance for an additional lap around the park with your group for an extra $25. 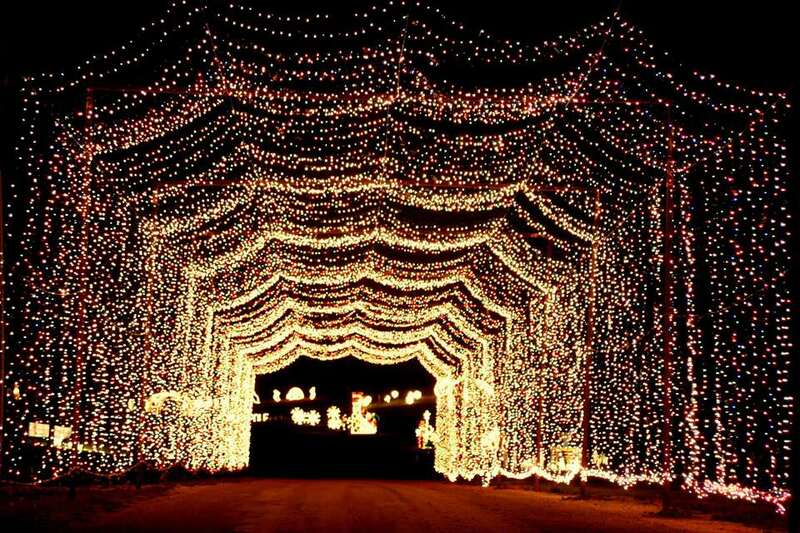 As you drive through the park, you'll see hundreds of thousands of lights stretching for more than a mile. There are holiday scenes, decorated trees, lighted tunnels, and other glittering displays for the whole family to enjoy. If you go later in the month, you may even catch the display while there's glittering snow on the ground, which just adds to the festive holiday cheer. Holiday Night Lights is located in Rotary Park in Wentzville, which is 45 miles west of downtown St. Louis. To get to Wentzville from St. Louis, take Interstate 64/U.S.Highway 40 west to Interstate 70. Take exit 208 for Wentzville Parkway. Merge onto Wentzville Parkway for about one mile, then turn left onto West Meyer Road. Rotary Park is at 2577 West Meyer Road.